For the first time ever, Matt and I have grown food for our own consumption. Sure we’ve eaten food from the farm before, but we’ve never actually grown something ourselves. 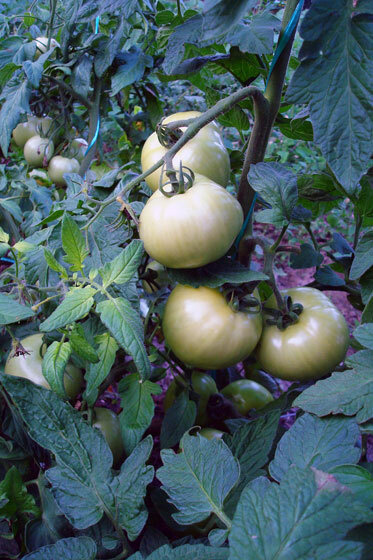 Ladies and gentlemen, gaze upon these beautiful tomatoes. We worked for these tomatoes. There was watering and weeding, suckering and staking. Sweat and dirt was involved. Alright, not all that much sweat and dirt, but, still, we worked! I think he meant that figuratively, but given the number of green tomatoes we have yet to ripen, we may literally be eating tomatoes forever. You won’t hear me complaining. Matt may not be the biggest fan, but I love tomatoes. 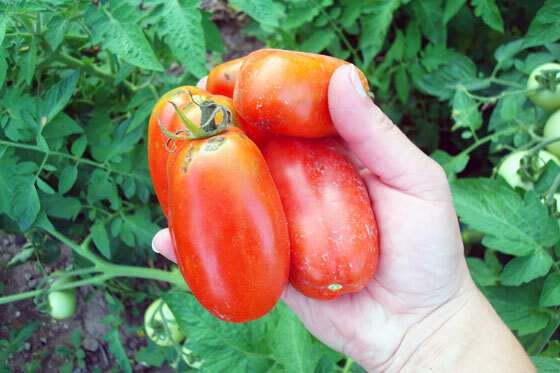 Caprese salads, homemade soup, burgers, sandwiches… I see lots of tomato goodness in my future. What about you? Are you a yay or nay for tomatoes? Any tips for avoiding canker sores? Anyone have any favourite recipes to share? Have you grown anything to eat this year? Do you feel pride in eating the fruits of your labour? Well done. Your tomatoes look fantastic. Fun isn’t it? It is fun! I’m really looking forward to having a proper vegetable garden next year. My tomatoes re-seeded themselves in after I left the wind-fall and split ones on the ground, so they have come back on their own the last two years. This year’s batch is the best ever – much stronger than the plants I bought and planted originally! BTW, have you ever tried fried green tomatoes? An different option for a side dish, especially once everything starts ripening at the same time and you can’t use them fast enough! Just dip tomato slices in an egg wash, and dredge through bread crumbs, Panko, etc. before pan frying. That’s actually where these ones came from. A bunch of plants had sprouted up in Matt’s Dad’s garden, and he gave them to us. We didn’t know what we had, but they’ve turned out pretty well. Those tomatoes look delicious! I think the home-grown ones have so much more flavour. My favorite “recipe” for tomatoes is to slice them, shake salt and pepper and maybe a bit more salt, and have them with bread and cheese. Mmm! I also am passionate about having them fried with parmesan sprinkled on. Ooooh, fried with parmesan sounds great!